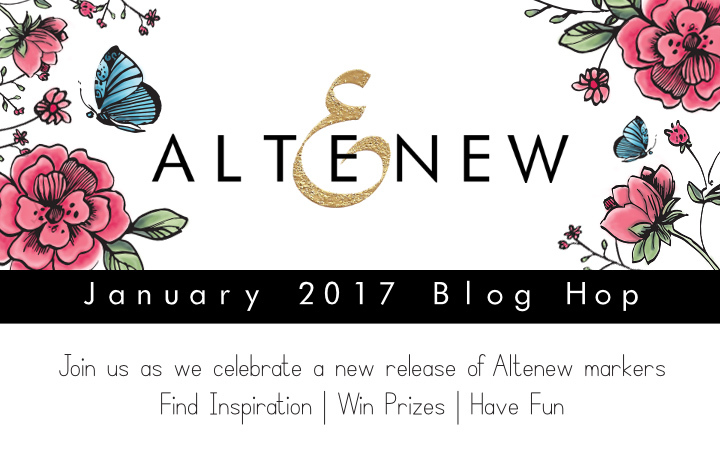 Hello and welcome to Altenew Alcohol Markers Release Blog Hop! Our design team and amazing guest designers sharing creations using new exciting product – Altenew Artist Markers. You probably came from techniques and cardmaking guru Jennifer McGuire blog. If not – you may consider starting from the beginning at Altenew blog and see what other members of Altenew’s design team and guest designers sharing (and also you have a chance to win a prize). I made two cards using these markers for today’s event. But before I start on cards let us have a moment and talk about the markers. Altenew Artist Markers are alcohol-based, allowing you to beautifully blend colors to any stamped images. Our various range of stamps is perfect for these markers. You can also easily pair them with Altenew Crisp Dye Inks to take your coloring to the next level! The colors in this set are designed to be as close as possible to our existing ink colors, so you can take the color guessing game out of the way when coloring. The markers are refillable and nibs can be replaced – Altenew will consider offering ink refills and replacement nibs in the near future. And I want to share my personal honest opinion about these markers. In a nut shell – I was very impressed by them from the first try. First of all I’m in love with the concept that they correspond to inkpad colors. Such a great option for Altenew ink lovers to have markers of the same colors and as was mentioned above – no guessing game of what ink better matches each marker. One think you should be aware of – Altenew Crisp Ink do bleed when colored over with alcohol markers. Which on one hand may seem to be a flaw. But I personally find that this can be beneficial. As these markers are so close to in colors to inks, ink bleeding looks not so much like bleeding but more like blending out of outline color, which is great for no like coloring. I like nibs of these markers. One is flexible, great for regular coloring and another is fine, for finishing touches or working out details. Sometimes makers can have a chisel tip, I personally almost never use this tip. So having more useful one is definitely a pro for me. These are alcohol markers, but they don’t have strong alcohol smell when you’re working with them. I don’t really care about smell factor, just something to note. And last but not least – they blend beautifully! I had so much fun coloring with them!! Ok, I’m finishing my blabbling and coming down to business. For the first card I did basic coloring with these markers and Peony Scrolls stamp set was used here. I stamped floral cluster in the top third of white panel, using masking where needed during stamping. The flowers were stamped with Ruby Red and leaves with Evergreen inks onto a white panel. Next I colored the stamped image with markers. Used R318, R304, R302 for flowers and G554, G715, G702 for leaves. I used basic or regular, if you will, coloring technique. Starting from the lightest color, then adding a darker one in areas I wanted to add shadows and then coming with the darkest one. And next I went the opposite manner, applying the middle shade to blend put the darkest one, followed by the lightest one, to achieve even more blending. Using markers fine tip I also added several dots around floral cluster. I stamped a sentiment from Painted Greetings, which first was stamped using Ruby Red ink and then, with small offset – with Jet Black one. I added several black sequins and clear droplets. Finally the panel was foam mounted onto a red card base. When it comes to alcohol markers one thing I like is that they can work almost on any surface, you’re not only limited by using paper. So for my second card I did coloring on vellum. Coloring on vellum is a bit different from paper. In case of paper marker ink soaks into the paper and different colors blend together. Vellum is not so porous, marker ink does not soak in but stays on surface. And with each stroke new applying color does not blend with but replaces one that was applied before. So you won’t get the same result as you would do on paper, but can get a very interesting effects, something like stained-glass. Another thing I have to mention – you want to color on the back side. That side where we color on vellum look rather ugly. But it doesn’t on the other side. Semi transparency of vellum hide all ugliness and what you can see through looks quite appealing. For this my card I first white embossed a floral pick from Best Mom set and a sentiment from Penned Rose onto a vellum panel. Next I colored the pick using B227 and B313 markers (flowers) as well as G554, G715, G702 (leaves). The panel then was adhered to a card base made out of Parchment Cardstock and several sequins finished off the card. Altenew is giving away a $50 gift certificate to 6 lucky winners – selected from the comments across all of the blogs in the hop. You have until Monday, January 16th at 11:59 PM ET to enter, and the winners will be announced on the Altenew blog on Wednesday, January 18th. I will also randomly choose a winner from comments left on this post and the prize will be $30 gift certificate to Altenew online store. Please leave a comment on this post by Monday, January 16th at 11:59 PM ET for a chance to win. I will announce the winner here in this post on Tuesday, January 17th. The winner of $30 Gift Certificate is Amy Vitriani. Congratulations! 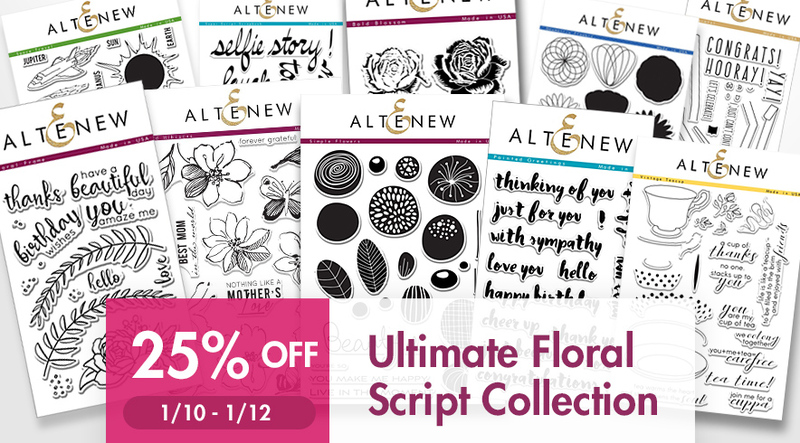 Enjoy 25% OFF Ultimate Floral Script Collection now through Thursday, January 12th at 11:59 pm ET. Not valid on prior purchases. No code needed. 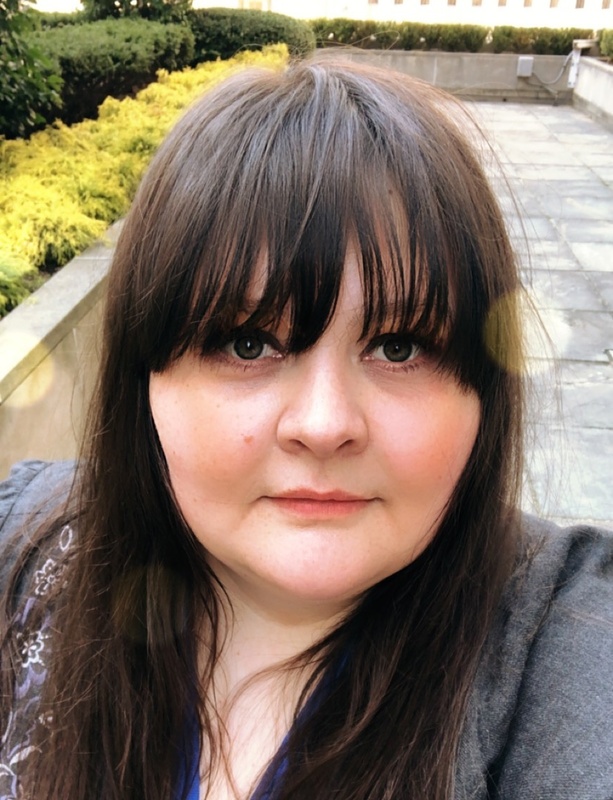 The next stop in the blog hop will be Lydia Evans. If you got lost, please go back to Altenew Blog. Thanks for sharing these lovely cards! Wow, these flowers really pop off the card! They are amazing! The coloring just pops! wowsier!! Wow love the colour of these markers, especially the blues on the vellum. Well done. Beautiful cards… I love the “no line coloring on the red flowers… Looks like the colors blend nicely. Love your coloring – bright colors are so cheerful. Wow! Both cards are so pretty but I LOVE the peony card! The coloring of the flowers is amazing! Love your card. Very beautiful! Love both of these cards. I specially love the color on the floral that looks coral. One of my favorite colors and I also love how you did the vellum…Great job..
Aww! Such Beautiful Cards! Loved both of them!Look forward to give the alcohol markers a try! Thank you so much for the inspiration and the opportunity to win this generous gift! Would love to win this! Beautiful cards, my favorite is the vellum card. I love both of your cards. I always love to see coloring done on vellum. Absolutely stunning! I love the no line coloring and the vellum coloring is also quite spectacular!! Can’t wait to try these markers out!! TFS! I love the colors, and it’s nice that they match with the ink cubes I already have! I love your vellum coloring! I would absolutely plant flowers like the orange ones you have colored. Beautiful. I really really love the effect of coloring on the back of the vellum… so beautiful! These cards are so pretty. I never have tried Copic because I couldn’t really afford. I think I will definitely be trying these markers. Love that they come in color family sets!! You did a beautiful job! I don’t have a favorite pen to work with yet because I don’t have any pens! I am new to stamping. Stunning cards. Love the colouring on vellum as well. Lovely cards! I especially like the look of the colored vellum. So much depth to your coloring – it’s beautiful! I love how vibrant they are as well! The reds are AMAZING! Beautiful card! TFS your beautiful cards. I love how you created two very different looks; I especially like the second technique using vellum… gorgeous! Thanks too for all the great info you shared about the new markers. Very helpful; can’t wait to try them. These are beautiful cards. You’ve done a great job with coloring! Absolutely inspiring! I am loving the Altenew stamps and the wonderful ideas by the bloggers. Thanks to everyone! 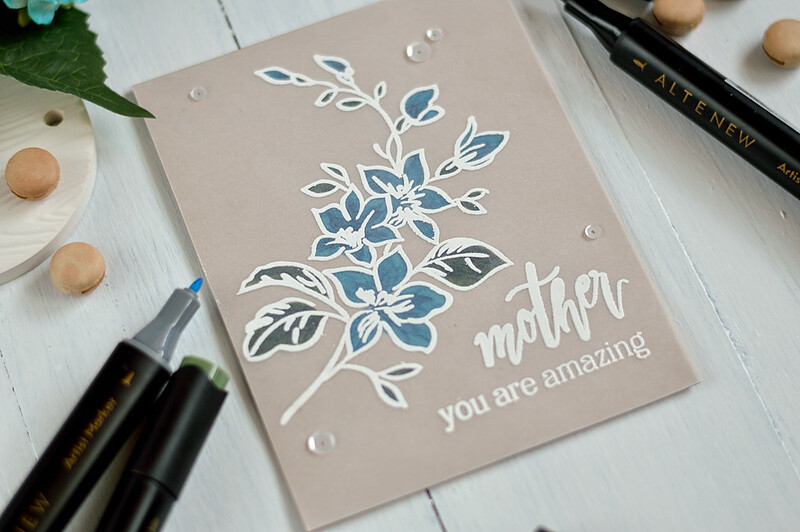 Great cards, looks like these markers are fabulous and rich on velum too. Thanks for the inspiration. As always I can’t decide which card I like more!! Both of them are very special and unique. And what a great examples of using markers! Thank you very much for inspiration! You created some very pretty cards! I really like the look of the image colored with these markers on vellum! Thank you for sharing. Thanks for the demonstration on vellum. Great to see how the pens will work on other types of paper. Beautiful! oooh such completely different yet equally gorgeous cards!! Lovely card coloring and design. I love your pink floral card and fell in love with coloring on the vellum. I want these pens. Two awesome cards ! I love to using my alcool marker on velum too. I just love the bright colors you get with the Alcohol markers. Fun to see white used for the embossing. I tend to use gold. flowers for coloring. I love the variety of your cards and the designs. It gives me a good idea of the possibilities with the new set of markers I just ordered. Thank you for sharing your creative talent. stunning card. love alcohol markers. Wow! Gorgeous blending! I especially love how the blues look on vellum! Love your deep colors and gorgeous card! Great new additions to Altenew’s stunning inks and images! Thanks for sharing your cards today highlighting the new Altenew markers. Fab cards. I especially love the look of the bold colours on the vellum. Thanks for taking the time to share your findings with us. The amazing mother card is so elegant. Very pretty cards. Thanks for the information about using the markers on vellum. Wow gorgeous coloring and those looks like great markers! Both cards are stunning! Beautiful! Love the way the new markers blend. You really made them look fantastic! 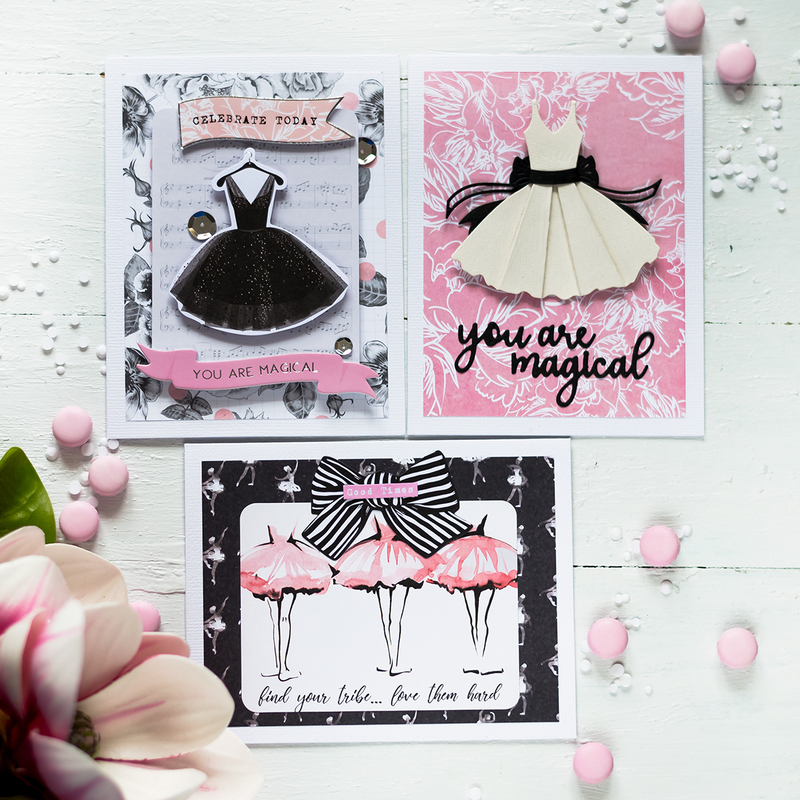 Such pretty cards…thank you so much for sharing! I cannot wait to try these markers! Thanks so much for the opportunity to win a gift card! Can’t wait to try these markers! Love both cards … but especially the one on vellum. So happy these pens have a fine and brushed tip. Both cards are just beautiful. I just ordered some white embossing powder, and I might just try this technique with the vellum. The peonies are beautiful. I have a volunteer plant that showed up in my iris bed one year, and I have managed to turn it into 3 plants and move the new ones next to my driveway. So lovely to look at in the spring and they smell so nice, too! One of my favorite flowers! Thanks for sharing your tips. I love your card using the vellum! I will have to try it…thanks for the inspiration and tips. The new marker colors are stunning! Your cards are just lovely! Thanks for sharing all the details. Both of your cards are beautifully done! Your cards are wonderful, the vellum is my favorite, looking forward to trying to recreate it this afternoon!! Everything I have seen of the markers so far is terrific, such bright colors. Beautiful, I am loving the markers and the stamps. The flowers are beautiful and coloring same. This is adorable! I had not even seen that stamp set before, and your little bouquet is just perfect. Wow! Your red coloring is amazing – so bright and vivid! Beautiful coloring with these markers on cardstock and vellum. Your cards are beautifully colored, I really like the red and green on the white, it is so fresh and crisp. Thank you for the tips for coloring on vellum, too. works on vellum too!! WOW amazing cards! 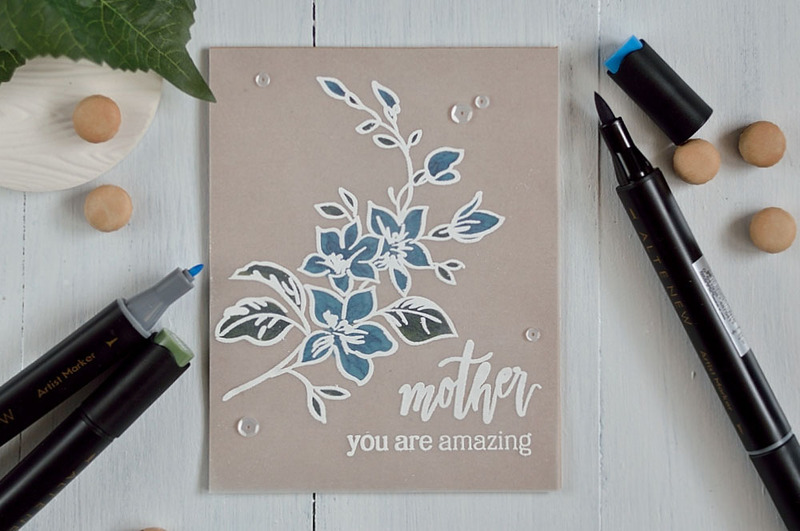 two gorgeous card – just ordered the markers – can’t wait to get them!! Beautiful cards and coloring. I especially love the vellum look! 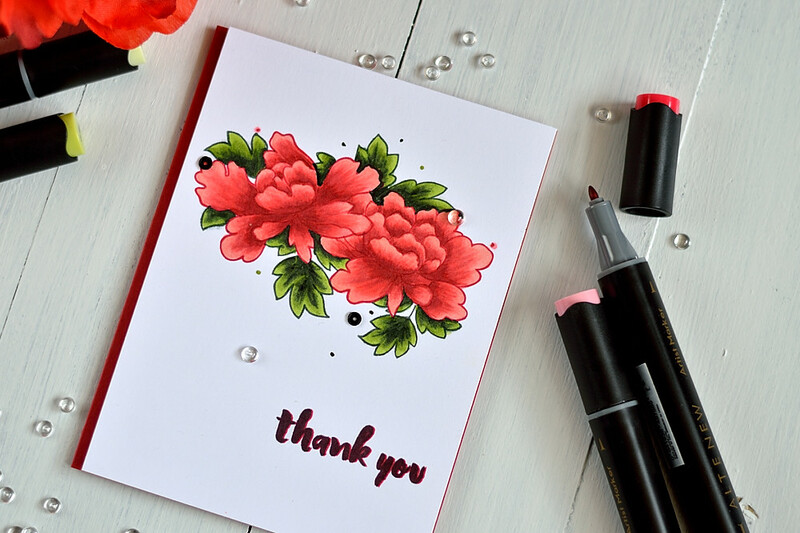 Thanks for the honest opinion about the markers and sharing your beautiful cards! Your cards and the coloring on them is gorgeous. Thanks for sharing. Gorgeous! Just simply amazing. Thanks for sharing. thanks for the tips on coloring on vellum. The blue flowers are beautiful. These are both beautiful. I love that pop of color on the red card! Your cards are beautiful! I’m looking forward to trying out Altenew’s new markers! I love the vellum on the kraft. Beautiful colors and design! Beautiful, vibrant coloring on your cards. Love your cards and love your coloring! I cannot wait to get my markers! Maybe I can color as good as you—– not. Oh well, I can hope. Such a beautiful cards you have created. Thank you for vellum tip, much appreciated. Your card is beautiful. I love these markers and would love to have a set! I love the shading on your cards! I can’t wait to try these markers. Gorgeous cards and fabulous showcase/review of the new markers! I’m daunted by the price of copics, living where I do in Canada, (which explains why I have but a handful that I don’t use because none blends with another…sighhhh) so these are a marvelous, fresh alternative! Love that they match the inks, which I do have and love! Thank you for the inspiration…. Love the colouring on your cards. These pens look amazing! Love your vellum card, these marker colors are fantastic! Your colouring is great! How exciting that Altenew have their own markets to match their ink! Your work is beautiful! I can’t wait to get my hands on these markers! Beautiful cards. Thanks for the tips for coloring on vellum. Your cards are absolutely beautiful and the colors are so vibrant. I have a few of the Spectrum Noir Alcohol Markers and would love to have more, so thanks for the chance to win. Thanks for sharing your projects. Such pretty inspiration! Love both cards! I love it! Examples on different papers and results in both vibrant and muted hues. These markers are turning out to be really versatile. This blog hop has really gotten my creative juices flowing & there’s no way I could have come up with all the ways to use this new product on my own. Thanks for sharing. Your cards are beautiful! I’m in love the the one done on vellum! Glad you reminded me that I can color on vellum with alcohol markers. Wow these cards is amazing . Love your beautiful coloring on the flower and the parchment card with vellum is awesome. Love the intense colours on your Peony Scrolls card! Love both of these! Favorite is the red. Can’t wait to get these markers! Thanks! Your cards are so beautiful! I love that you can use these markers on vellum. These are beautiful! I especially love how you showed how well these markers color on vellum. Both of your cards are just stunning, amazing coloring. I’m so excited to try the new Altenew markers! Very beautiful cards. Thanks for the chance. Hugs, Nellie. Thanks for sharing your thoughts about these new pens. Look forward to using them. I appreciate your opinion and thoughts about these new pens. Look forward to using them. beautiful cards! I love the look of vellum. Beautiful cards, specially the vellum one! Beautiful colouring job on the first card. Absolutely atunning!! Love the deep intensity of the colors you achieved. They are beautiful. I’m blown away by the vibrancy f the colours and how well they blend. Beautiful work. very lovely flowers. Love the vellum coloring. Amazing – especially the coloring on vellum. Thanks for the great info on the new markers. Stunning card! Such beautiful coloring and cards. Thank you for giving tips on using vellum and the new markers. Really nice work, two very different looks, both beautiful! I loved how the new Altenew markers have a finer bullet nib for detail work on flowers. Like in the center of a flower. Can’t wait to get them! Two lovely cards, but I especially appreciate your use of the vellum with these markers. The result is exquisite. Thanks for sharing this. I love both cards but the second one is truly beautiful. Beautiful designs. Love the vibrant pink flowers. Your first card Pops with color, but I love the vellum one better. I have seen this technique before but never used it. I will be trying it very soon. Thanks for all the info on the new markers and love your awesome cards! ?? Love how bold you made the colors. Great creation, love the colors used. Thanks for a chance to win! Beautiful cards – I especially love the second card. Beautiful cards! Love the dimension! 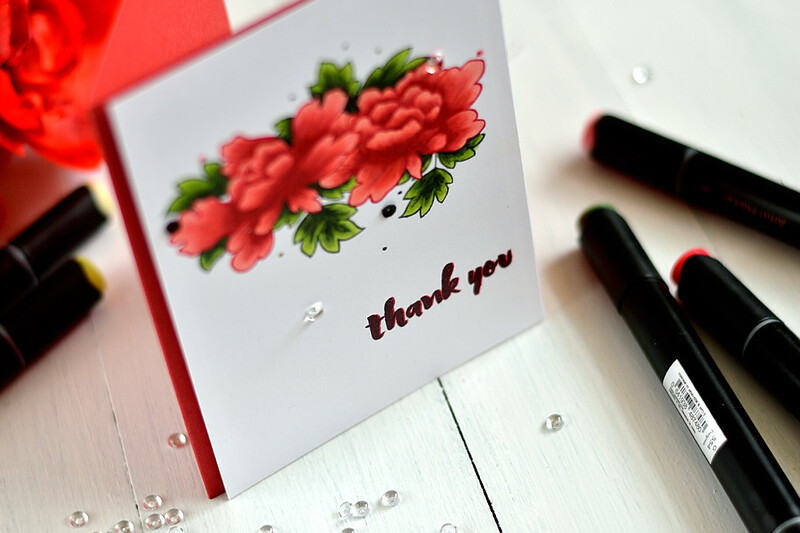 Beautiful cards, love the vibrant red peonies and the floral sprig on vellum! Thanks for tips about these new markers, I’m excited to try them! Oh what great cards. Thanks for sharing all of the information about these markers! Your blending is so smooth and perfect. Also thanks for sharing the tips on coloring on vellum. I always wondered why mine always looked messy! Thanks for the great review of the markers. Since I am new to alcohol markers it was a great help. I love the cards you have created. Especially like the second one with vellum. Beautiful cards. Love the blending and the softness of the transition between colors. Beautiful cards. I especially like the vellum. Thank you for the advice on how to use the markers on vellum! Beautiful cards! Love them both! Thanks for the great tips on using these fabulous markers on vellum. I love this look! Love the depth you achieved here. Beautiful cards and love the coloring on vellum. So pretty. Great job. Amazing creation, the markers looks great! Oh Svitlana, your cards are so beautiful, especially the first one. 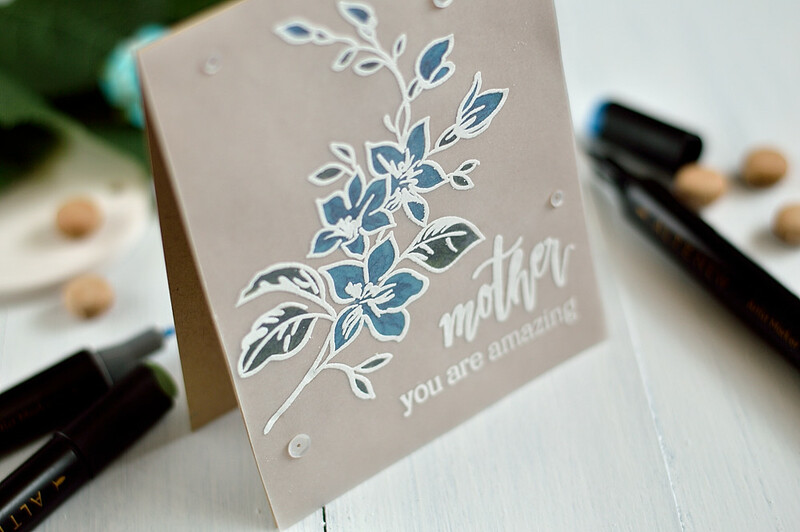 A great idea about stamping with their dye inks first and using it to your advantage for no line colouring. Very clever! 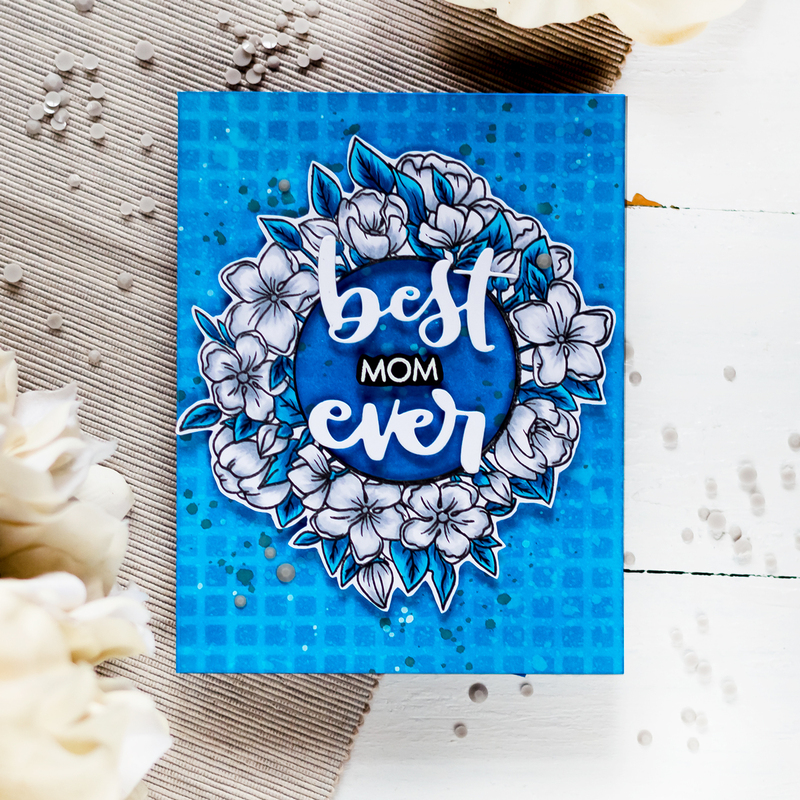 Gorgeous coloring and shading on your beautiful cards! Love that these markers coordinate with the inks! Fabulous! Love the look on vellum too! Your cards are gorgeous, Svitlana! And your coloring with these beautiful markers is stunning! Lovely cards! The colours in your first card are just so beautifully vibrant & the offset sentiment looks fabulous! Beautiful Peony scrolls and beautifully colored too! Your cards are very pretty! Thanks for showing how the new markers work so well on vellum as well as cardstock! Your red flowers are gorgeous. The new markers seem to do a great job too…. Coloring on Vellum was absolutely beautiful. I’m excited to give it a try……thanks for sharing these cards with us. Beautiful! Love both cards. Nice to see how well the new Altenew markers look on vellum. Thank you for sharing. WOW, WOW, WOW ! Svitlana, your two cards are breathtaking ! I really love how you used these new markers which, by the way, seem to be really great ! I’m really thinking on investing in these new markers ! Thanks for sharing and for inspiring. Fantastic cards you made. Love how you used markers on welum. Looks this markers are very good investements. Lovely cards, especially the vellum one. Love the simple sophisticated look of the vellum card! Both cards are beautiful! I marvel at your ability to color. Both color families are striking. Love the video so full of inspiration. Thanks! Oh, the blue on kraft is pretty! 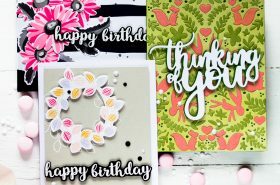 Gorgeous cards!Thank you for sharing and for the blog hop! Thanks so much for sharing – and I LOVE the vellum card! your designs are so vivid, they just about jump off the page! I love your work. Just beautiful! Beautiful cards! Thanks for showing how these markers look on vellum! both cards are beautiful, but your second card is my favorite, so amazing! Both cards are gorgeous, but I’m amazed by the vellum one! Oh so pretty!!! I love the bold colors on the first card!! Love your card! The gold at the top and bottom is the perfect finishing (framing) touch. Altenew was very smart to come out with a collection of colors. I’d love the chance to purchase my first alcohol markers 🙂 Thank you for the inspiration! Your vellum card is so beautiful! The blue really pops! Love your projects, very pretty! Very lovely cards. You are talented at blending. Thank you for using them on vellum, I love these cards they are very beautiful. Love what you have done with the new markers, your cards are gorgeous. Thanks for the great inspiration!! Thank you for your insights into using these new markers! Your cards are just stunning. Beautiful cards! Those new markers look like fun. I love the vellum card! Way to go! Love the vellum technique thanks for sharing. Very beautiful. Your cards are just beautiful – thanks so much for sharing!! Love the blue on the kraft! I love your 2 cards but the red one really pops! It is so bright and I love you’re coloring is really nice. I like the second one but it’s more subdued. I am so totally impressed with all the cards I’ve seen on the hop. When you love to create cards and your passionate about what you do, it shows in your cards. It certainly shows in yours. I am so excited to be able to win something and I hope that I do. Life has been kind of hard for me being a caregiver to my parents but making cards, stamping and coloring helps a lot. Gorgeous cards,, such beautiful coloring on the flowers!! SO pretty!!!! I want to start colouring!!!! Beautiful cards!! I love the blue Mother card. It’s just stunning! Beautiful cards! Especially loving the coloring on vellum! I love the vibrant marker colors! They make the beautiful flower images pop right off the page! Great idea to use vellum too! I love your idea with the velum and the craft cardstock! So unique! And the markers really look pretty on that velum! Very pretty cards. Your shading on the red card is lovely and I’m a big fan of the stained glass look of the blue on velum card! A wonderful technique. Thanks for sharing. Beautiful projects. Love the vellum. Stunning cards! Love that you’ve used both the new markers and inks, really shows what a great job Altenew did with matching the colors 🙂 Thank you! Gorgeous cards! Love the vellum touch! Those markers are amazing! ? Gorgeous cards, both of them. Thank you for all your tips and for sharing this stunning cards, love the one on Vellum. How beautiful! Such lovely cards and terrific blending! Thanks for the tips on coloring on vellum! So pretty! Really love the colouring on vellum. I am looking forward to playing with the new markers! Beautiful cards!! I will have to try colouring on vellum. Thanks for the inside info on doing that successfully. Beautiful cards. I love blue, so my favorite is the one on vellum. Thanks for the inspiration and the chance to win. You never disappoint with your coloring…always beautiful and I love how you showcase the new markers … so beautiful! Very pretty cards…love the colouring on vellum. Beautiful cards! Love the depth you got with your coloring. These are two of the most beautiful cards I have ever seen. 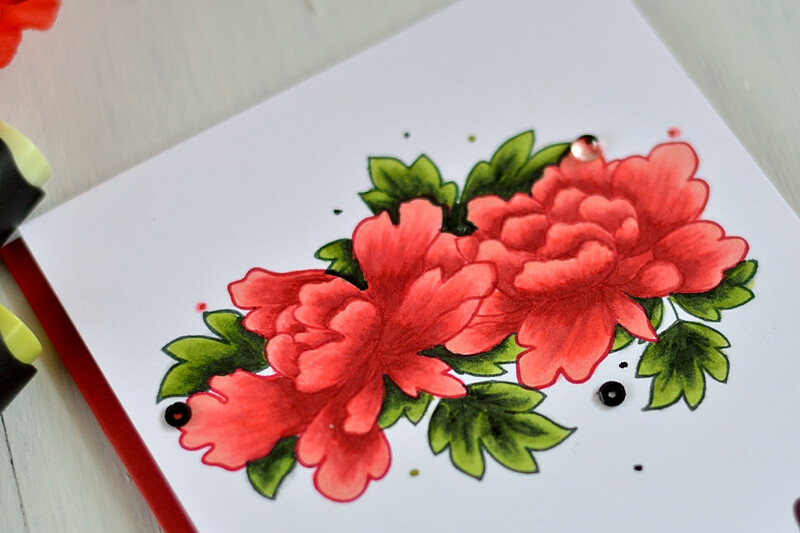 I have the Peony Bouquet stamp set and I ca’t wait to try to get a result similar to yours. You noticed that I said “similar”..
Beautiful cards. I especially like the vellum one. Beautiful cards! Good to know that Altenew inks bleed with the markers, but you make a great point of them sort of blending that way. Thanks for the insight! Wow!! Such beautiful cards!! The coloring on the first card is awesome!! Love the coloring on the vellum in the second card!! Such pretty projects! Love the embossing and colouring on the vellum! I love the vellum card….lovely blues…nice with the white embossing. Cards are lovely, especially the peony one. I like the way you offset the sentiment since it really makes it pop. Wish I thought of it, but I’m willing to learn so thanks for sharing your talent. The Ruby Red is stunning on your card! Thank you for the great ideas! Beautiful projects and wonderful inspiration on the blog hop. Nice job on your cards. You guys make it look so simple and wanting to try every single technique. Thank you. Such lovely cards. My favourite is the vellum card. I love that technique. both are so pretty…love them! Beautiful cards. Love the marker colours. Such such beautiful cards! Thanks so much for sharing! Love the choice of stamps, I love florals! Can’t wait to try out these new altenew markers! They look fantastic! They are so beautiful. Love how you coloring on the first one. and the second one on the vellum is fabulous, too! Love your cards, especially the vellum one! Thank you for your tips…..
Wow, your flowers are stunning and I have never thought to try using alcohol inks on vellum. Will definitely give this a go! Thanks so much for sharing your beautiful card! 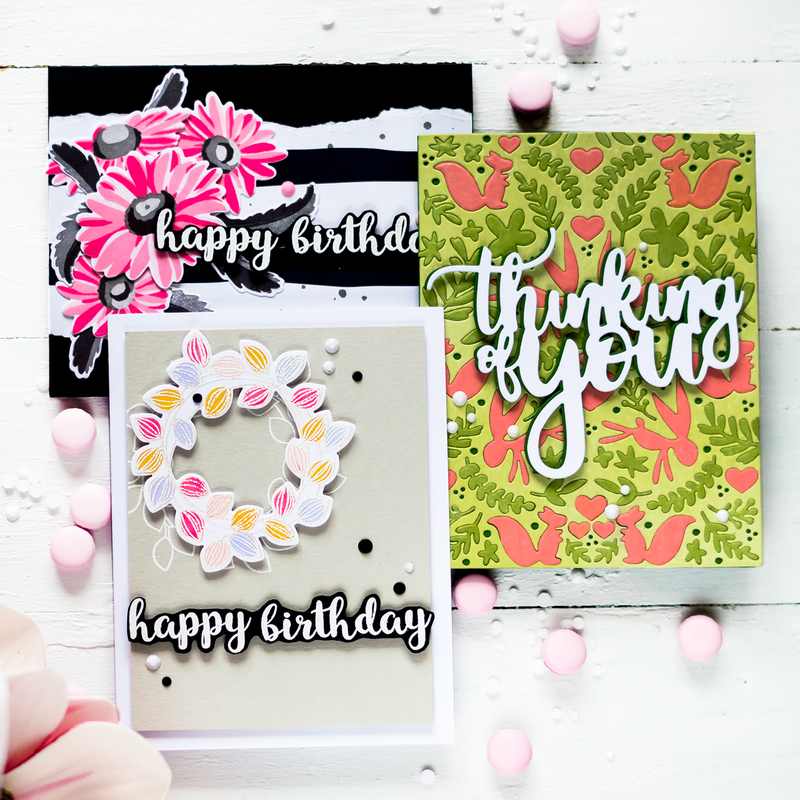 Gorgeous floral cards. The alcohol markers look great. Gorgeous cards Svetlana! Love the designs and that the markers match the ink line colors, thanks for the inspiration. Have a wonderful day! Very pretty in RED..nice to see the markers used on vellum too! Very pretty cards! Love the one with the red flowers the best. Thank you Altenew for coming out with markers that match your inks!!!!!! Can’t wait to get mine. Love the vellum card. Beautiful! Gorgeous colouring and especially love your vellum card, the card stock colour is beautiful!! I’ve never colored on vellum yet, but the way you colored is so beautiful. Thank you for sharing the tips on vellum! I love how these marker colors blend on your cards. I always learn something new each time when I read the blog hops. Thanks for the tips on vellum! I haven’t tried it yet. Your cards are beautiful! Your cards are very pretty, Thank you for the information about coloring on Vellum , I am going to try it. Wow both cards are colored very nicely! Those red flowers are very pretty. The blue looks nice too and I like the idea and tip to color on vellum. 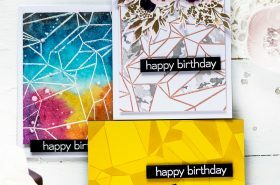 Gorgeous cards, your coloring is beautiful! Your coloring is very pretty! I love your cards!! Great cards! Beautiful coloring! The colors you chose are so pretty! Love these markers and I can’t wait to get them! This is a great blog hop with so much talent! Thanks for sharing yours! Beautiful cards Svitlana!! And thanks for your thoughts on these new markers as well!! They do look like they blend beautifully!! And I loved your use of the matching ink pads!! So pretty. Thanks for sharing ? Beautiful cards. Love the colouring on vellum – I always love the muted result it gives. Need to do this more often! Your cards are pretty. I like that you showed how the markers work on vellum also. Thanks for sharing! I especially love your white embossed card. These markers are amazing! Thanks for sharing! Great description for coloring on vellum! The coloring is beautiful! I especially like the reminder about vellum! Stunning cards. I never thought about coloring on vellum but I plan to try it! 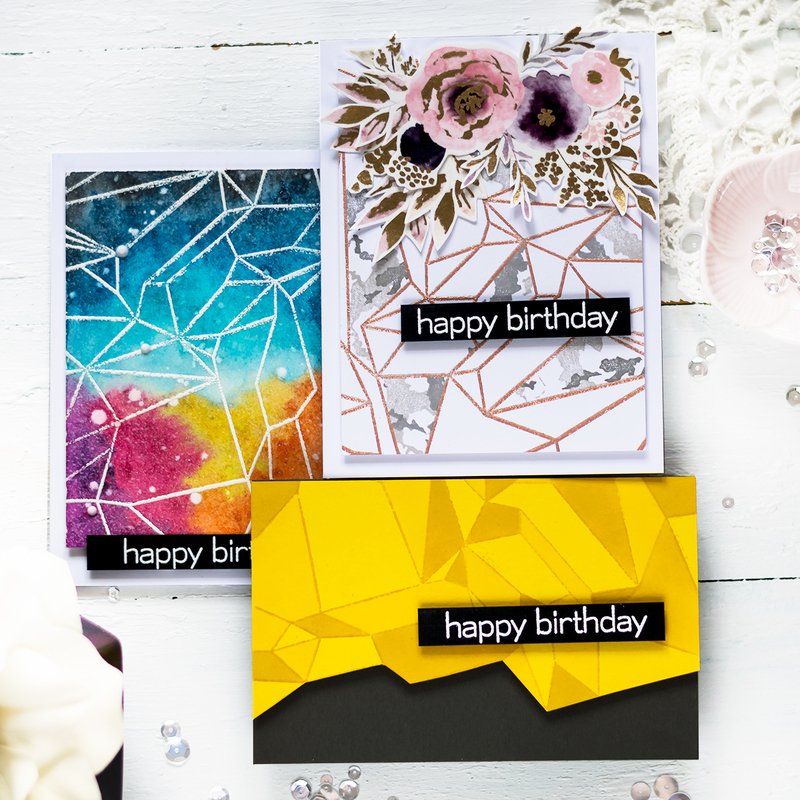 Simply gorgeous cards Svetlana! 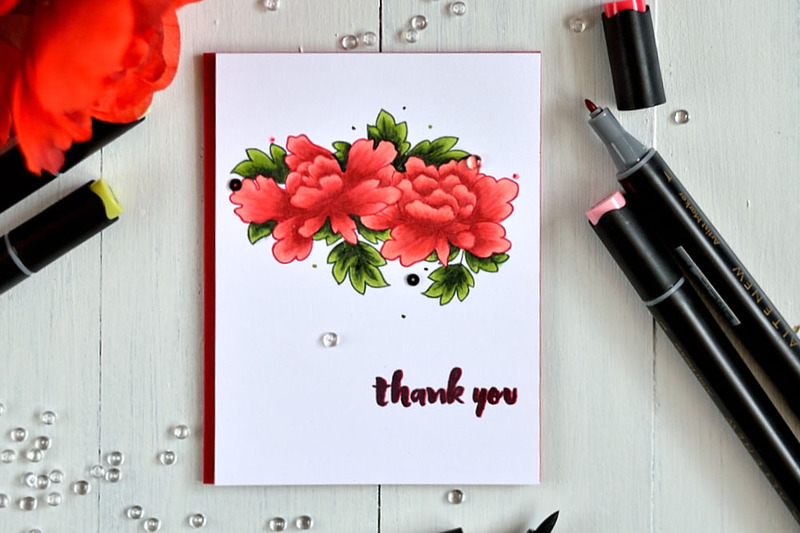 Love your card designs and colouring. Thanks for the inspiration and chance to win! Beautiful cards! Those flowers just pop off the page! Simple and elegant designs. The no line coloring you did was great. I love the soft look of mixing ink pads with alcohol markers. So cool! I love them all but I would probably use pool/blue out of Set A. I am new to the technique of using markers so this is exciting. Love the vellum card! Always looking for ways to use this fine paper, beautiful! So cool! I love them all but I would probably use pool/blue out of Set A. I am new to the technique of using markers so this is exciting. Love the Vellum Card! Love your flowers. Great colors. Both of the cards you created are so gorgeous in detail and colors. I was glad you showed a card using the vellum too! I just love this blog hop as the quality of cards is amazing. I love Kraft paper so much and am delighted to see what you did with it. Very very nice. Thanks to Altenew for their generosity with the certificates. We are very much thrilled for the chance to win one! These markers look every bit as amazing as Copics. I like that the colors match their inks perfectly. Beautiful cards. Beautiful cards, love the first card, so vibrant. I love coloring on vellum. Beautiful cards! Very pretty colors for your cards. Thanks for sharing. Beautiful cards! Thank you for sharing your techniques! Looking forward to trying the new Artists Markers. Svitlana, your cards are beautiful! I especially love the Peony Scrolls card with the great, vibrant colors. Thanks so much for sharing with us and for participating in this great hop and giveaway. I’m so glad you shared an example of using these markers on vellum. These markers are really showing their capabilities and comparability to other more expensive alcohol markers. I’m glad you shared that they are refillable and nibs replaceable. The white embossed flowers are really effective! Both of the cards are very nice and yet very different. Thank you for the tutorial. This is a lot of fun doing the blog hop. Love your cards and that you used Vellum. I love Vellum but am not always sure how to use it. Beautiful cards. I like the way the markers work on the vellum. Thanks for sharing. Oh my! Such pretty cards and your colouring is fantastic. Thank you for sharing such beautiful inspiration! Both cards are gorgeous! Thanks for the tips for coloring on vellum also! Congratulations to Amy! Lucky girl!!! Beautiful cards! Thank you for sharing tips about using alcohol markers on vellum. Your coloring is simply phenomenal! Delightful cards and beautiful colouring, Svitlana! beautiful coloring, I love the water color based theme of this kit!